Going through divorce? Already divorced? This powerful 12-week program is designed to guide you to encounter Christ – with all of his love, mercy and healing power in a deeply personal way. Surviving Divorce was created to move past the pain of one of life’s most difficult experiences. Don’t go through separation or divorce alone. 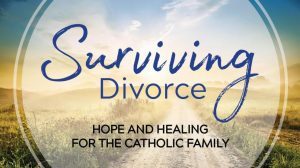 Surviving Divorce leaders have been through divorce themselves and are examples of the healing and restoration that can occur after the breakup of a marriage. Surviving Divorce healing ministry is open to ALL, regardless of faith or length of your separation or divorce. Listen to a recent interview on SpiritFM by clicking here. A new program begins February 7, 2019. We will meet on Thursdays from 7-9PM. $30 includes materials. Registration is now open. Please complete & submit the form below. For more information, please contact Gina Gawienczuk at gina@sainttims.org. REGISTRATION FOR CURRENT SESSION IS CLOSED. For additional information, video and testimonials about program, please check the tabs below. Read article about program in the Tampa Tribune here. For more information, please contact Gina at gina@sainttims.org. The 12-week DVD series was produced by popular speaker and author, Rose Sweet, who is about relationships and helping readers to put Catholic moral principles into real-life practice. “Every problem we have with others comes for our not remembering the Love we already have.” She incorporates Theology of the Body principles into all of her topics and is faithful to the teaching Magisterium of the Catholic Church. She’s been a guest on national radio and television programs and her books have been translated into several languages.